Lost & Found Project explores a new direction with a new audio drama – “Shayna”, which examines the journey of a young singer-songwriter in New York who can’t catch a break. She is estranged from her brother and ailing mother, stuck in dead-end relationships, and stalled creatively. But when a beautiful, haunting melody lodges itself in Shayna’s mind, it unearths a family mystery and a century-old injustice that only Shayna can make right. Created immersive soundscapes of contemporary and old New York. An immersive theater production. From the moment you enter the HOUSE OF ESTHER, you experience Esther’s complex and dynamic world, taking shape only during the two nights of Purim, when the many faces and voices of Queen Esther are revealed. 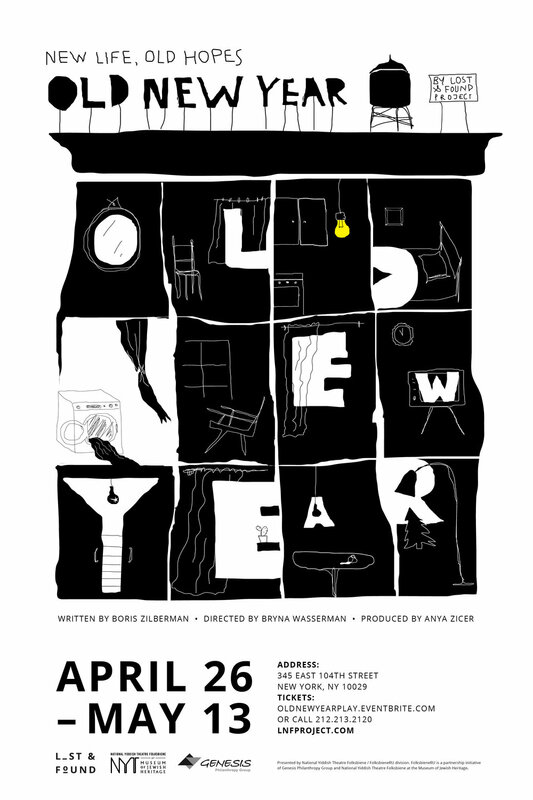 In Old New Year, a group of unrelated strangers stuck in the mundane habits of NYC’s “rat race” long for fulfilled and successful lives, each with their own definition of happiness. One day they are all invited to a party by a mysterious benefactor who will offer them an easy yet uncomfortable deal of realizing their inner-most desires in exchange for forsaking their culture and identity as they know it. Deli Books is an original and captivating musical production in Russian for kids (ages 2-8) and their families. The play is about a boy who has acquired too many books and has no time to read them all. So what does he do? He decides to EAT them. The play teaches children how much pleasure one can get from simply sitting down and reading. Through the Curves is a visceral play built from real-world interviews with contemporary women. A multicultural mosaic covering magic, childbirth, sexuality, desire, abuse, body image, sensuality, and pain.